Dr. Genhua Niu is an Associate Professor of Environmental Horticulture at the Texas AgriLife Research Center at El Paso and Department of Horticultural Sciences. Her areas of special expertise are in environmental stress physiology, plant production in controlled environment, and photoautotrohic micropropagation. Her current research areas include identifying drought and salt tolerant low water use plant materials for urban landscape, quantifying growth and physiological responses of crops to drought and salt stresses, and determining the minimum water requirement for urban landscape plants (trees, shrubs, and ground covers) for maintaining a healthy landscape while conserving water. In addition, Dr. Niu is evaluating the salt and drought tolerance of a range of bioenergy crops for semi-arid regions. Dr. Niu received a Ph.D. in Horticulture from Chiba University, Japan. 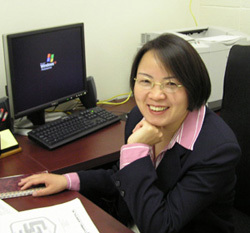 Prior to joining Texas AgriLife Research, she worked at Michigan State University on ornamental crop production under controlled environment, the USDA-ARS Alternate Crops and Systems Lab on modeling water stress and elevated carbon dioxide concentration effects on corn plant growth and development, and a private company on micropropagation and nursery crop production in South Carolina.